Yesterday I stopped by Gap on 34th Street to check out Erica's look. Here's why I love the Gap on 34th: the gals are downstairs (more intimate, no fishbowl effect); the merchandise is well-organized and spaced (no claustrophobic bumping into Europeans); the bathroom is next to the dressing rooms; and there's rarely a line for the dressing rooms. It's like a sweatshirt (slightly American Apparel) but it's much more stylish and has pockets, thank you. This long cut gently eases you from trapeze tops to the more fitted styles for spring. Wear it with a little skirt or shorts and stockings. For $29.50 you hardly have to justify post-holiday spending. 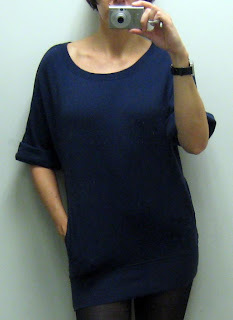 Another nice surprise and another good transition piece is this sweater dress, $69. It's not too loose, it's a great length and it also comes in black. But I'm partial to this light grey. Could Gap be doing pre-spring? Goodness, it's contagious. For rainy or slightly chilly days, this bright coat sets you up with strong spring coloring ($69.50). It can also claim a bright pink sister. 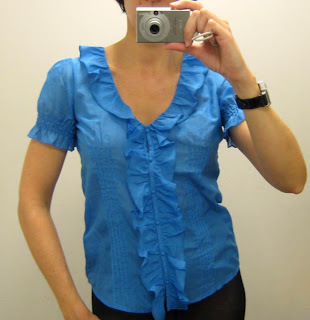 Check out the sales racks before you go and look for this blouse, $23.99. I think I like it because it's a pretty blue and it's girly which is so not me. We have to remember to mix it up every once in a while. NB: tomorrow morning I'm going to the last day of the Shoe-In sale at Hammerstein Ballroom that's been highly recommended by Racked. Boots, shoes, Marc Jacobs, Frye, Miss. Sixty, Biviel....I'll let you know if there's anything left. nnb: Of course, I forgot, Patrick Robinson is now afoot at Gap! Thank you, Mr. Robinson, we appreciate your clean & pretty designs that have no tinge of "dull."